Rattana Lao (Amp) is interested in understanding the influences of westernization, globalization and marketization in education policy. 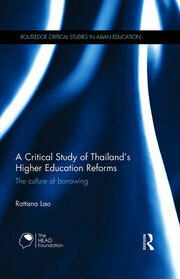 Trained in Comparative and International Education at Teachers College, Columbia University, Rattana's work has used the politics, economics and culture of borrowing to analyze Thai higher education. Prior to Thammasat, Rattana worked as a Post Doctoral Fellow at the University of Hong Kong exploring the phenomenon of private tutoring in Asia. I have an interdisciplinary training in Development Studies, Comparative Policy Studies, Globalization Theory and Higher Education Studies with a research focus on Thailand. After receiving the first class honor from Faculty of Liberal Arts, Thammasat University, Rattana received the Anandamahidol Foundation scholarship to pursue graduate studies abroad. She spent two years in London and obtained the Masters of Science in Development Studies from the London School of Economics and Political Science as well as a Masters of Research in Social and Educational Research at the Institute of Education. At Teachers College, Columbia University, she had the privilege to work with and learn from Professor Gita Steiner-Khamsi and developed a theoretical interest in the politics, economics and culture of borrowing.